Resorts in Santorini have long jostled for prime real estate and jaw-dropping views of the immense caldera on the island’s western coastline, leaving the flatter, but equally breathtaking eastern shores and vineyards relatively pristine and undisturbed by the madding crowds that arrive each summer. 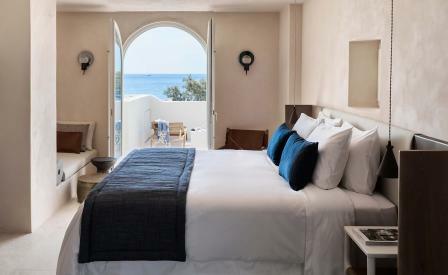 Staking a particularly handsome stretch on the black volcanic sands of Perivolos Beach on the island’s south-eastern tip, the 12-suite Istoria is a languid sprawl of raw stonework, greenery and white walls. Behind the thick masonry of the three-storey compound, Athens-based Design Laboratorium has fashioned, quite literally, a cool modern interior of mosaicked and concrete floors, roughly hewn timber furniture, bed throws in summery hues, and terracotta accents. When not picking the best sunbathing spot at the 3km-long beach or by the capacious pool, or being massaged in the Asian-themed spa, guests notch up the louche hedonism with chef Alexandros Tsiotinis’s grilled surf, and mod-Greek and Mediterranean menu.